When people in the Avon, Indianapolis, and Plainfield areas are looking for an SUV with unique features, both inside and out, there are many to choose from. One such model out there today is the Toyota C-HR. But is it right for you? To help answer that question, our team at Andy Mohr Toyota created this 2018 Toyota C-HR review. We’ll go over everything you need to know to make an informed decision. Read all about this vehicle below, and don’t hesitate to contact us if you have any questions. The 2018 Toyota C-HR features a precision-cut, diamond-like exterior styling. The vortex-styled 18-inch sport alloy wheels, along with the cantilevered, aerodynamic rear spoiler add an extra bit of attitude to the already uncommon silhouette. The standard halogen headlights with unique cluster LED Daytime Running Lights, plus sculpted taillights not only help you see and be seen all day and night, but they add to the vehicle’s edgy look and feel. The C-HR also comes in various color options to really stand out on the road. They include Ruby Flare Pearl, Radiant Green Mica, and Blue Eclipse Metallic. The unique look of the Toyota C-HR continues into the vehicle’s interior. It comes standard with soft-touch materials that include a leather-trimmed steering wheel and satin-plated shift knob. Sport fabric-trimmed front bucket seats come standard, and the available 8-way adjustable driver’s seat with sport bolsters and power lumbar support help the driver find that perfect seating position behind the wheel. Heated front seats are also available, so the driver and front-seat passenger can get nice and cozy on colder days. And dual-zone automatic climate control comes standard, so you can stay nice and cool, and your friend can warm up, or vice versa. There are also plenty of high-tech features in the 2018 C-HR to make your drives more enjoyable. The vehicle comes standard with a 7-inch touchscreen display with apps like Aha Radio™ that has over 100,000 stations to listen to. You can also use the Bluetooth® capability to stream audio or make phone calls, all while keeping your hands on the wheel and your eyes on the road. The 2018 Toyota C-HR comes with a 2.0L 4-cylinder engine that delivers 144 horsepower and 139 lb-ft of torque. And with the Continuously Variable Transmission with Intelligence and Shift Mode, you’ll get a smooth and efficient drive. When you want a sportier ride, Sport Mode will sharpen the throttle for a livelier acceleration. And to take on corners like a pro, there’s the MacPherson strut front suspension with SACHS dampers. This suspension has angled strut bearing and a large-diameter stabilizer to help stay in control at all times. While the C-HR has great handling and power, it’s also very fuel-efficient. This SUV can achieve an EPA-estimated 27 city/31 highway MPG,* so you can spend more time traveling and less time stopping to refuel at the pump. 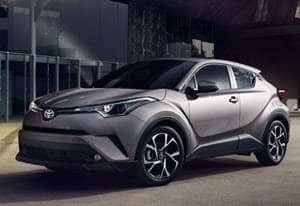 With an exterior design that stands out from the crowd, plus advanced features and great handling on the road, the 2018 Toyota C-HR may be the vehicle for you. 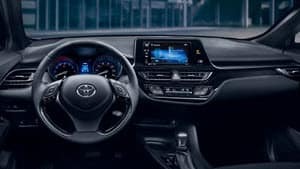 But to help determine if it’s best for your drives around Avon, Indianapolis, and Plainfield, you’ll need to get behind the wheel. To experience this vehicle in person and test out its capability, schedule a test drive at Andy Mohr Toyota today! *2018 C-HR preliminary 27 city/31 highway/29 combined MPG estimates determined by Toyota. EPA ratings not available at time of posting. Actual mileage will vary.